We arrived in Toulon to clear skies and a crisp morning. Actually, we docked across the bay from the city. To reach Toulon, one would need to take a water shuttle provided by NCL. However, Toulon isn’t exactly teeming with touristic splendors… so, you’d need to transfer to the train station for a 1+ hour journey to the better sights Provence has to offer. With wait times, you could easily spend 2+ hours each way. 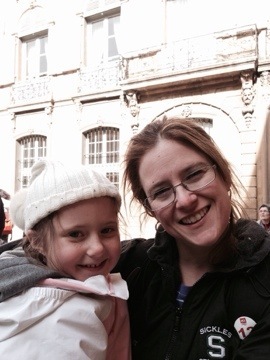 Given that, we opted for one of the ship’s shore excursions: a day trip to Aix-en-Provence. This involved a somewhat lengthy but scenic bus trip the 70 or so kilometers to Aix. Upon arrival, we took a two hour walking tour of the city’s mostly minor sights. The city is quite charming. 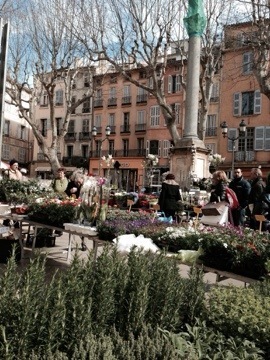 Ultimately, Aix is an environment to immerse oneself in… to taste the produce, smell the flowers, eat the food, drink in the atmosphere. It’s a place to stroll and linger. In the end, I was happy for a small taste of Provençal life, but I was left unsatisfied by the brevity of the visit. So, we’ll certainly have to return here sans cruise ship. We had dinner last night in Le Bistro, the ship’s French restaurant. Other than a somewhat lackluster onion soup, the meal and wine were superb, including a delectable chocolate Napoleon as the final course.